Something new I found from those Dream Cacao folks. 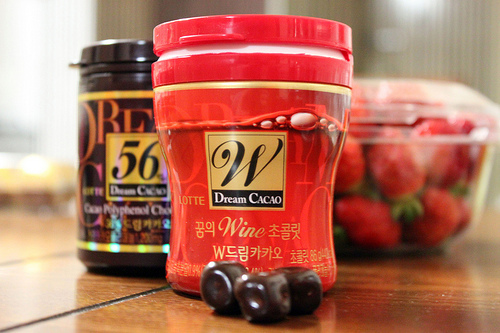 This is a wine-flavored chocolate. According to the insert inside the container, it’s infused with powdered Chilean Cabernet Sauvignon. Even though, of course, there’s no alcohol in them, they do taste a little alcoholic–a little winey. If you gave them to me and hadn’t told me they were wine infused then I’d think they were raspberry, as in Korean Bokbunja Raspberry Wine. They’re not too bad, really. I’m looking forward to having them with those strawberries. A thought… can you imagine the uproar if they came out with something like this in America?